Have you ever had a BACON chocolate fondue? You haven't? Oh my, you are missing out on the most wonderful taste bud tantalizing flavors! 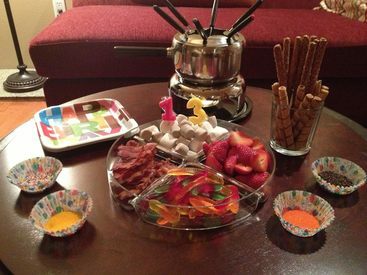 I found these pictures on the internet of a 13th birthday party FEATURING a BACON chocolate fondue! This boy was definitely a BACON ADDICT. For his dinner choice, he decided that he just wanted a nice quiet dinner at home with his family. His chosen menu included BACON-wrapped tenderloin steak, lobster tails, baked potato, and a green salad with baby shrimp. Such rich, grown-up tastes!